Our custom rows are now all new and improved. 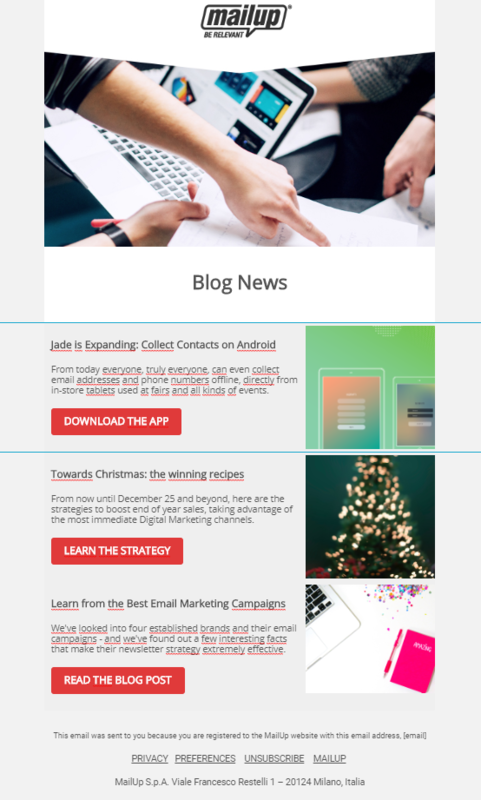 Send out your latest blog articles or new e-commerce items dynamically – you can now create your email in just a few clicks, by dragging and dropping custom content blocks into the message. Now you have full control over their order, layout and style. 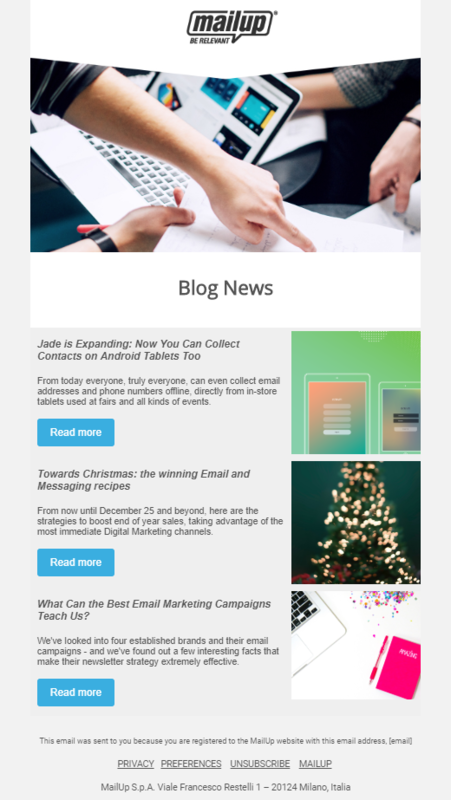 Newsletters that are created by themselves? Campaigns-showcases with your e-commerce‘s new items that are composed in just a few clicks? This is already a reality for many companies, but now they can count on new features that add a high level of control over the email while guaranteeing the same immediate and rapid creation. Refining the layout in detail. Do you have an e-commerce site and want to send an email about the latest new items in your catalog? 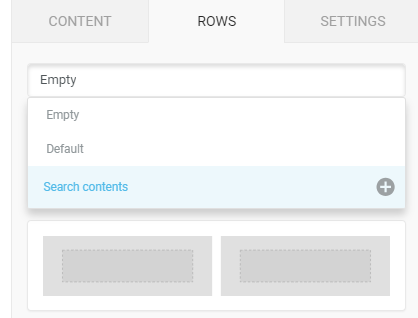 With custom rows, you can retrieve content from external platforms and insert it simply by dragging the content blocks into the message. No more copying and pasting or obsessive checking to verify the correctness of contents and links. See the email below? With custom rows you can create it in just a few clicks, aligning the design with your brand identity. Is the potential here still unclear? It might be useful to start from the beginning, using a practical example to help. Add custom rows to the same emails which retrieve content from different sources. This means that you can count on the immediacy of custom rows while maintaining a high level of control over the layout and richness of their contents. > Files, uploading a .csv, .json or .zip file (max 5MB). Where can I use the content that is stored in a source? One of the possibilities, and the one we’re going to discuss today, is to call up the source in order to insert its content with a custom rows. Now that you understand sources, let’s take a look at how to set up an email with the new custom rows. 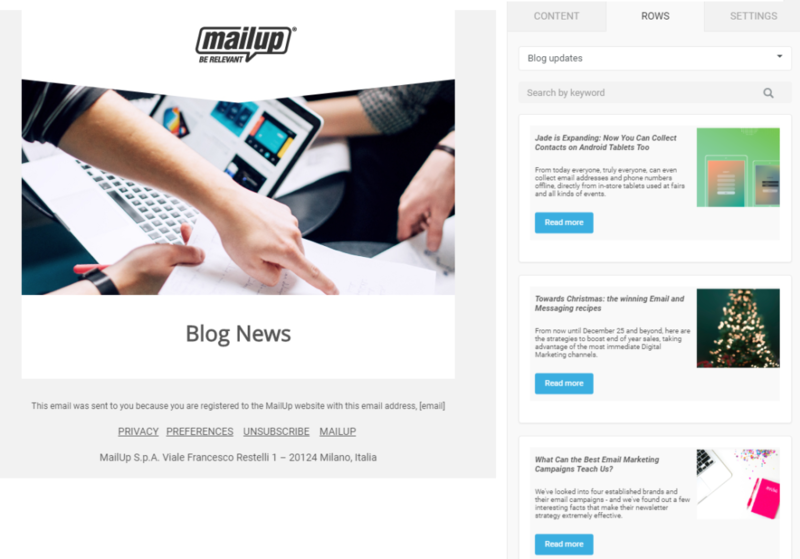 Let’s apply the custom rows to a Content Marketing strategy to create emails that communicate the latest articles of a blog (MailUp’s blog in this example). The first step is to create an email template, or structure, which will populate with your blog’s latest publications from time to time. A sort of cover image of the email which makes the email recognizable, week after week. To communicate the details of the brand sending the email and offer the chance to unsubscribe or share on social networks. Click on Search contents, the new item in the list that lets you access the new custom rows commands. 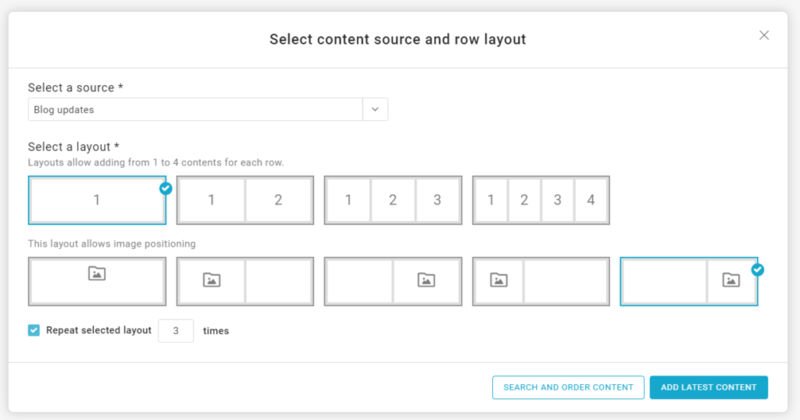 This is an important innovation, because it lets you manually choose which content to insert and the order to place it in. We chose the latter method for our example, because we want to insert the Christmas post in the first place; even though it was not the most recently published article, it is the most relevant for our audience. After having chosen the content blocks, you’ll find them in the menu on the right. We are not in love with the italics in the titles, moreover we always use Open Sans in our emails. Additionally, the descriptions of the posts are too long, forcing the call to action to not be in line with the image. Blue is not enough to catch the recipient’s attention: a brighter tone is better, and one that doesn’t appear anywhere else in the email and really makes the button stand out. The email doesn’t have room to breathe; we want to give the whole thing a bit more airiness: we will increase the padding between the rows. Another important feature of the custom rows is the ability to add custom rows to the same email that draw from different content sources. It is easier to understand the potential of this aspect by continuing with our example. 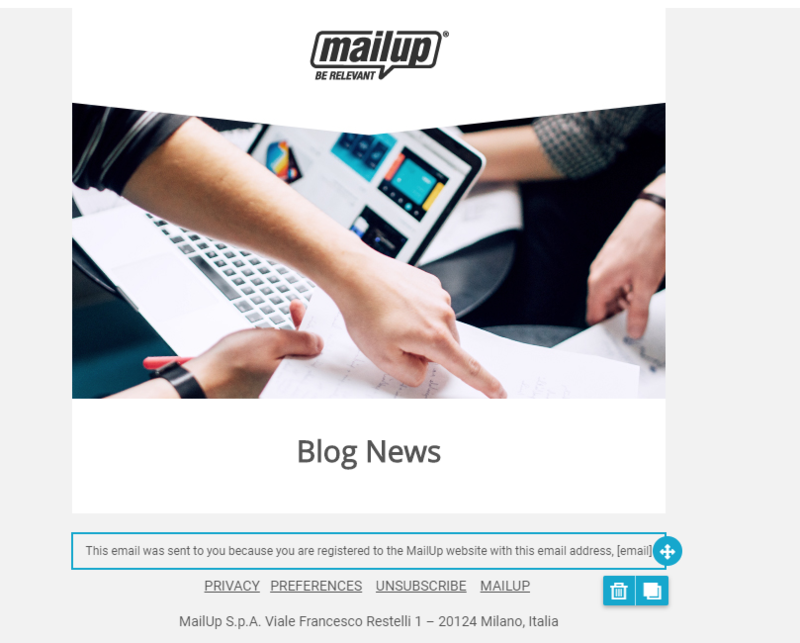 We want to add content concerning the guests of MailUp Marketing Conference to the email we just created. In short, this feature makes it possible to cross-reference sources and create emails with different levels of content in just a few clicks. Enter the content you want to select. Custom rows can be adapted to the most diverse objectives, and not just Content Marketing (as in our example): an e-commerce site can quickly populate a mobile-responsive DEM, recalling prices, images, links to product pages, or deciding to only include the items it wants to promote. Or brands can use custom rows to quickly segment emails. How? By filtering the special offers for the shops in Milan, Turin, or Rome directly in the platform. 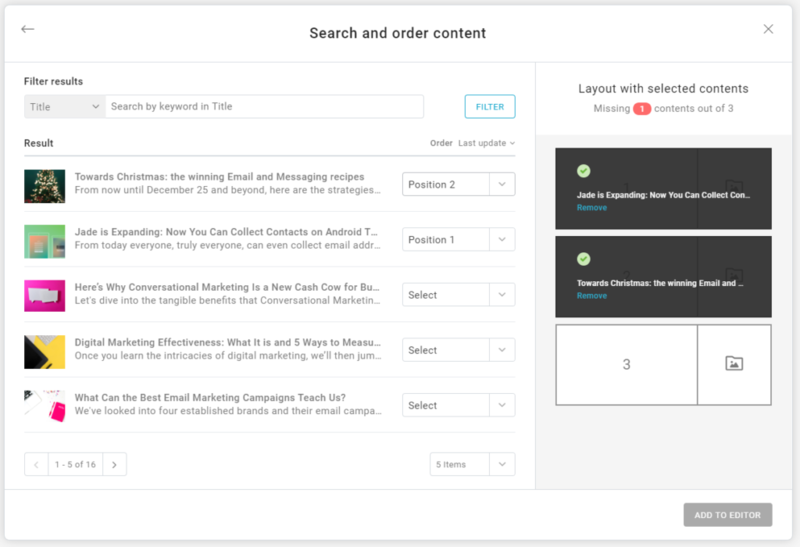 Custom rows let marketers invest more time and energy where they are needed, as MailUp’s custom rows will see to creating emails quickly and intuitively. Haven’t tried our platform yet? Request a free trial of the platform today.